What can you do when you want to impress your potential clients. The first rule of thumb is don't use a laser pointer when your finger will do. And shake hands. People get irritated when you vaporize their skin. RMG - Our specific ideas create tangible results. When was the last time your computer's spreadsheet salvaged a deal? I was once called upon to conduct research for criminal cases at the Federal level. All the casework was for major crimes so each time the defendant's life was literally on trial. They could spend the rest of their life behind bars. The attorney involved with our defendant loved technology. So much so that when the laser pointers first became available he bought one. For use in the courtroom to be able to point with the little red dot to highlight exhibits, underline a note for the jury, and impressively, from many feet away. Until then, lawyers had to walk over to their charts and use a stick or their hand to add emphasis. I sat in the witness stand answering questions about the investigation while the lawyer attempted to use the laser pointer. Refusing to emerge from behind the desk he got the pointer to work intermittently, pointing out to the jury locations on a map - a critical piece of evidence in the case. The pointer worked and then didn't. The jury, judge and the court reporter tried to concentrate on both my words and the action of the infamous pointer. The laser dot appeared then disappeared. The lawyer smacked the pointer, checked the batteries, stopped the entire proceedings and the flow of information to repair the pointer. The judge waited patiently. The attorney came to the judge as did the other attorney. A request was made to take time to fix the pointer. The judge asked the lawyer to just use their hand to point out details. But the chart was positioned so his body would block the jury. The chart was never set up to have a body in front of it. Others helped move the chart. Another attempt was made to use the pointer, this time with the lawyer standing next to the chart. I watched the lawyer and then the jury to see their reaction. The scene was comical and most were smiling. In his attempt to appear completely convincing, professional and compelling, the lawyer managed to let a simple technological device not much different than a flashlight overwhelm his presentation. If it were not for the fact the dismayed defendant was facing his total loss of freedom, I would have thought the play unfolding in front of me was funny too. But it wasn't. It was devastating. Emotionally draining and confusing. Everything hoped for was lost. Including the defendant's case in the end. Your sales and marketing staff has one chance to make a good impression. Whether they are using the latest software, phones, PDAs, or laser pointers does not matter. No amount of computerized slide shows is going to compensate for a solid marketing relationship between potential clients and your staff. I had a momentary flashback during a corporate presentation on the executive level a few years ago. As I watched the sales presenter set up the demonstration for a group of time pressed sales targets from a major corporation, he began fumbling with the connectors of the screen projector and their laptop computer. Understand, there were maybe five people in the room that mattered. The entire presentation could have been done with the salesperson sitting next to the other four, in front of the laptop. Instead, he wasted precious minutes, appearing inept, and undermining the entire program by trying to get the connection to work reliably. All this took place in front of the executives. A desperate call went out for IT assistance. Not that the IT department had anything to do with projectors, but there was a computer involved so I think that was the logic behind the effort. Of course everyone waited patiently, quietly for the IT guy to arrive to tell the salesperson that he didn't know how to fix the projector. I thought about the laser pointer while I sat watching the executives' faces drop. They were tired of the show and it hadn't even started yet. 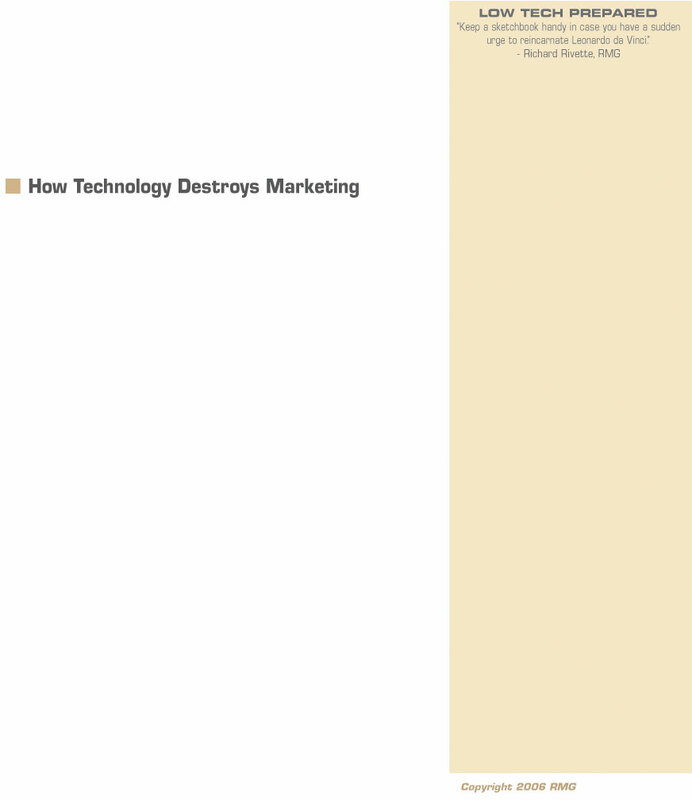 The technology destroyed the marketing effort. Weeks of work down the drain. The marriage we have to electronic devices can often kill the sales. I hope we can come away with some greater insight. First, nothing beats face to face contact anyway. Sit with your client. Give them the presentation, casually if necessary, without the computers if necessary. Print some sheets in advance as backup with your entire slide show. Copy a set for everyone in the room. Sit and explain your proposal. It's more intimate. A lot less sterile and more convincing. Put yourself in the above client's position. You are thinking ahead to the time when you have a problem in the relationship. Some error has developed in the product you purchased. How did this company handle the error? If their response to a simple connector malfunction was any indication they would hold up your entire business and fail miserably. You would not do business with the company. The salesperson lost the sale before he even started. You are probably thinking. How could it get any worse? What was it about the presentation that completely destroyed the deal? Couldn't the executives overlook the sales presenter's and the IT staff's inability to work with the technology? Forgiveness and patience are virtues. Perhaps. Normally yes. But here's the problem. The salesperson was selling videoconferencing and screen projection systems. The company specialized in the product they were trying to demonstrate. It didn't function. They had the wrong connector. No one prepped the conference room that day. Everyone assumed they were ready instead of completing a dry tech run of everything they intended to do that morning. They checked the night before. But not that morning. I guess the moral is simple. Never rely on technology. All these devices are great tools. But they are just tools. Sales are emotion. Nothing can replace a personal relationship. Are you prepared for your next sales opportunity? We can check out your sales presentation, your staff and even give you valuable analysis without bias. We will be hypercritical and find fault. Here's the best news of all. It's going to cost you, but not as much as a lost sale. Call for your appointment today. We'll bring our laptop.